Indiacakes.com is a cake manufacturing company featuring premium quality, frozen, fully finished packaged cake products for the Food Service, Catering, C-store and In-Store Bakery.We specialize in creating unique, and custom, high-quality, finished cakes for a variety of operators that are not generally found in ready-to-sell formats. 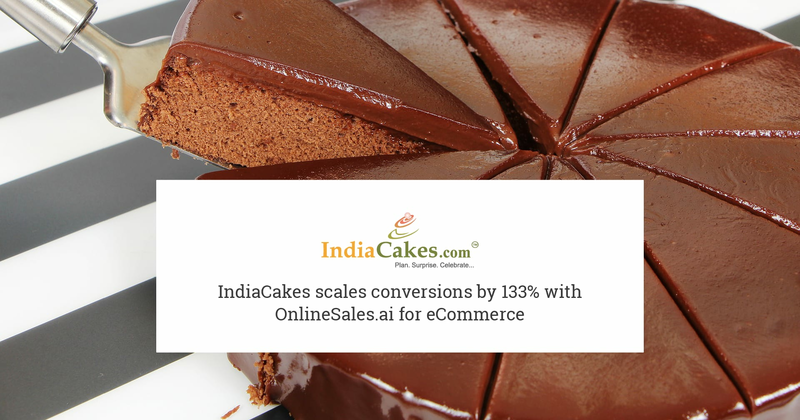 IndiaCakes on-boarded with OnlineSales.ai OMP in July 2016 to scale conversions. A veteran in the industry, they aimed to conquer Google’s search results pages. OnlineSales.ai ensures that, as the number of conversions increase, their corresponding CPLs always remain healthy. Ideally, a healthy CPL number is that which is lower than the AOV of the product catalogue, and we continue to deliver this successfully. With OnlineSales.ai’s set of optimizers, best performing keywords were identified and were bid aggressively upon. All these were done with a 98% increase in spends between July to December 2016, and the team at OnlineSales.ai continued to maintain healthy CPLs, CPCs and other vital performance metrics while scaling conversions. "OnlineSales.ai’s one marketing platform with its intelligent features helped us to optimize our Google ad campaigns in a very smart way and guided us to achieve our targets in no time. Their Customer Success team was always helpful and very responsive."